After some playing with JUNG (see examples 1, 2 and 3), I feel that it will be hard to use it for the application that I am writing… I need more edge versatility that the one provided by the simple API of Jung. So some more searching brought me to the JGraph framework. JGraph seems to provide great visual flexibility and also includes graph editing properties, which are needed in my application. As usual, the documentations of these open-source frameworks is not very user-friendly (there is a user manual, better than the one provided by most projects), but no step-by-step guide on how to use the framework. Since I am starting to learn it, I will try to produce it as I go along. The first example (adapted from the example provided with the framework’s source code) creates a simple graph with two nodes and a vertex. * contains a graph component with two vertices and an edge connecting them. As you can see, the code is fairly simple. 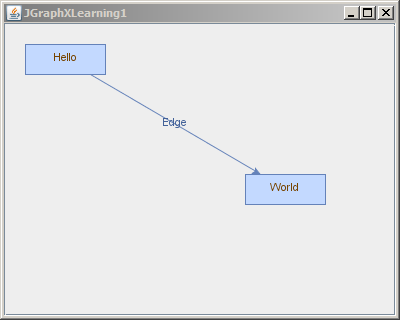 The JGraphXLearning1 class is a JFrame on which a mxGraphComponent is added. This component is the view of an mxGraph, which is the model of the graph. graph.setCellsEditable(false);   // Want to edit the value of a cell in the graph? graph.setCellsMovable(false);    // Moving cells in the graph. Note that an edge is also a cell. graph.setCellsResizable(false);  // Inhibit cell re-sizing. graph.setCellsSelectable(false); // Now I can't even select the cells!!! graph.setEnabled(false); // Catch-All: no interaction with the graph. graphComponent.setConnectable(false); // Inhibit edge creation in the graph. Thanks, it was very helpfull. thank you very much for this tutorial..It builds successfully in netbeans but it cannot run and gives (“Exception in thread “main” java.lang.ExceptionInInitializerError”). it shows that errors is from mxGraphComponent.How to fix this admin? It’s been a while… don’t think I’ll get to this soon.